This video demonstrates the use of adaptive equipment and how to choose the correct device to increase manipulation abilities. Door knob openers, car adaptations, scissors, power tool adaptations, light switches, and other adaptations are presented and demonstrated. 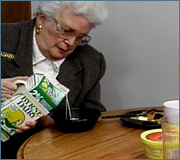 This video also demonstrates various adaptive feeding devices to improve independence in feeding and additional devices and strategies to assist the adult to manage medication needs.